Applications include industrial systems, consumer products, or monitoring equipment for maintenance purposes. The EDS Vibration Monitor, OW-VIB, offers an innovative way to easily monitor and control vibration within an environment. The OW-VIB has a highly sensitive vibration sensor which enables the detection of changes in the cyclical motion of equipment. This early detection of changes from "normal" environments allows arising maintenance issues to be identified prior to failure reducing costly repairs and downtime in manufacturing facilities. 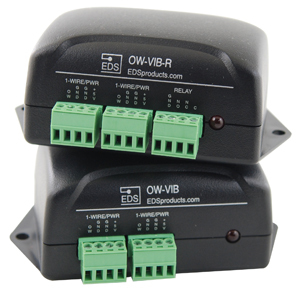 Beyond the sensitive vibration sensor each OW-VIB possesses a LED, conditional search support, a pass-through 1-Wire connection and an optional relay. Together these features offer an efficient and flexible system for monitoring vibration at one or more locations within a building. The LED and optional relay response times are extremely fast; the sensors are able to respond appropriately (turn off power/alarm siren/etc) even before the monitoring application is aware an alarm has been triggered. Since the EDS Vibration Monitor's alarm functions can operate independently of the 1-Wire host adapter, the sensor can be used as a standalone method of disabling equipment in instances of shock. Resetting the relay is done by merely cycling the Vibration Monitor's power.